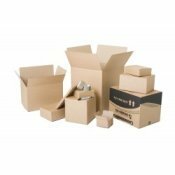 Available for online ordering and next day delivery, we have a great selection of shipping boxes ideal for the transit of goods. Our expert team can help advise on the best shipping box for your products, including the size and the best type of box for shipping heavy or awkward shaped items. What’s more, we offer very competitive pricing on bulk orders. Size: 5.5" x 8.8" x 1.3"
Size: 5.5" x 4.4" x 1.3"
Single Wall Cardboard Box (229 mm x 152 mm x 152 mm) 9" x 6" x 6"
Size: 12" x 9" x 9"
Size: 12.83" x 8.94" x 0.63"
Size: 9.02" x 6.26" x 0.63"
If you need strong, robust shipping boxes for sending your products to customers or distributors, here at Boxed-Up we have a fantastic range, including single and double wall shipping boxes, as well as seasonal gift boxes for those special occasions. To help you find the ideal box, you may find our Box Finder tool useful to help find the ideal box.